The Great 88 slot has five drums and 30 fixed lines. The slot offers a set of base symbols, a scatter symbol, a wild symbol, a bonus game, a doubling game, free spins. The symbols are related to Chinese culture. Therefore, on the drums you can see its various objects: dragons, hieroglyphs, caskets, green frogs, wooden flutes and others. Wild – clapper, is able not only to replace other signs and help to form a prize chain, but he himself brings payouts. Bonus – red boxes, with the appearance of three such symbols, one of the possible bonus games is launched. Top Symbols – this mini-function will turn the casket into expensive symbols. Thanks to this, a combination with a good win is formed. Instatnt Wins – in any of the boxes will be on opening up to three coins. The more are received by the player, the more the win will be in the end. Firecracker Wilds – when you open the boxes, the firecrackers that are there will explode and in their place, as well as in neighboring cells, wild symbols will appear, helping to form a winning combination. Free Spins – in the boxes can be up to five jade coins. The accumulated number of coins will mean the available number of free spins. Bonus Wheel – is the most profitable bonus game. You can participate in it if you find a gold bar in the box. You have to twist the wheel, divided into sectors with different prizes: multipliers from x5 to x20, 8 free spins, go to the game Mega Win Wheel. In it again it is necessary to twist a wheel of success, but on it already there will be improbably sweet prizes. 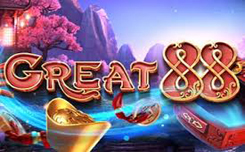 Great 88 slot is an exciting game due to a lot of different bonuses, but the main highlight of course is the game process itself, which will please with an excellent set of options and opportunities to get a very large win.